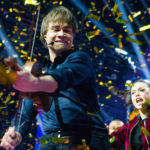 The Norwegian Eurovision winner Alexander Rybak and the Swedish winner Benjamin Ingrosso met in Scandinavian talk show Skavlan before they battle it out in the Eurovision finals in Lisbon on May 12th. 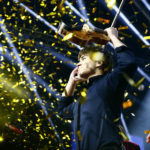 The Norwegian contestant Alexander Rybak and the Swedish contestant Benjamin Ingrosso are to compete in the international Eurovision finals in Lisbon. When they met in Scandinavian talk show Skavlan, they performed a mashup of their winning songs «That’s How You Write a Song» and «Dance You Off». 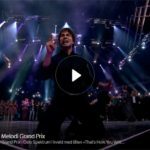 English translation of the last Facebook-video: “Norsk eller Svorsk”? 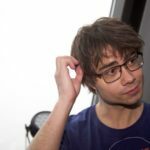 10 quick questions for Alexander Rybak. 2. A life in major or a life in minor? 3. Sleep in pyjamas or sleeping naked? 4. King of the bar or king at the dance-floor? 5. Tinder or looking in town? Do you still have your profile or have you closed it? Are you still on Tinder? Skavlan: Ohhh…If only I could speak Norwegian again. I miss Norwegian. I miss Norwegian. But I am caught in this..language. 7. Voices in the head or silence in the head? 8:Fight? Or run away as fast as you can? 10. Finally: 12 points from Sweden or 12 points from Russia?